The School of Rural Medicine at UNE offers a seamless mix of metropolitan, regional, rural and remote experiences, enabling you to learn from a wide range of academic and local clinicians with clinical experience starting in your first year. We are distinguishing ourselves as the national leader in providing regional and rural training to produce a quality medical workforce. We pride ourselves on giving our medical students a truly rural experience, exposing you to the challenges and rewards of rural practice as well as the needs of rural and remote communities. Each year we only take 60 medical students (compared to 200 at most medical schools) into the Bachelor of Medicine - Joint Medical Program. Our smaller cohort means you get a highly personalised experience - from direct contact with teaching staff to individual access to equipment (no sharing lab facilities!). Our smaller class sizes also mean that on clinical placement you have 1:1 or 1:2 ratios with medical staff. So instead of being in a large group, you are actively engaged with patients and have individual time with your supervising clinician. There is a strong emphasis on student support to help you succeed in your studies including access to a broad range of scholarships, extra-curricular clinical opportunities and learning experiences designed to enhance your medical student training. UNE has a five-star (maximum) rating for Graduate Satisfaction from the Good Universities Guide, so you can be assured you will receive an outstanding medical education at our School of Rural Medicine. If you want to find out more about studying medicine at UNE or the admissions process please email us and we'll be in touch. Bachelor of Medicine - Joint Medical Program (JMP) is jointly offered by the School of Rural Medicine at the University of New England and the University of Newcastle in partnership with the Hunter New England and Central Coast Local Health Districts. 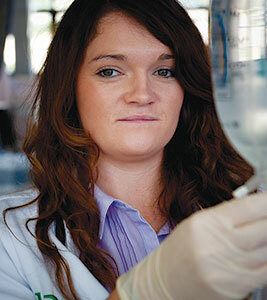 "I chose to go to Armidale as a location to study in the Joint Medical Program. I liked the idea of studying medicine in a rural environment."